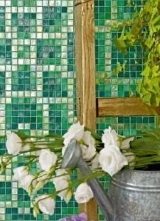 Kitchen Tile Backsplash Designs for Cabins and Cottages! 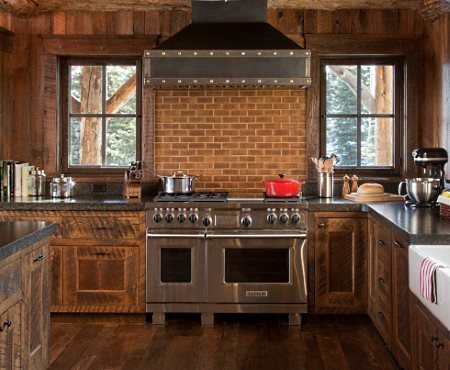 The kitchen tile backsplash designs featured here are ideal for cabins and cottages of all types -- as well as year round dwellings. 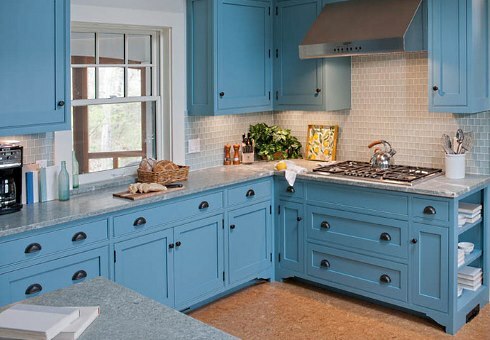 Whether used in a cozy lakeside cabin, country farmhouse cottage, or majestic mountain retreat, this durable surface covering complements a wide range of looks. 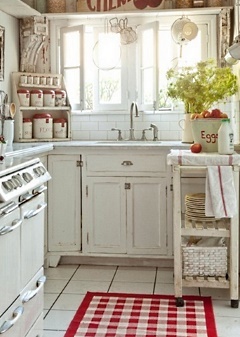 Tile backsplashes work equally well in kitchens with simple open shelving and those with glass-fronted cabinetry. 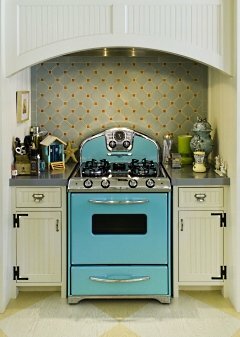 In kitchens with vintage appliances and those with the latest gourmet models. 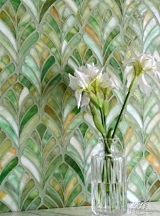 The versatility and timelessness of tile is undeniable. Kitchen pictured at right by Taste Design Inc. Contrasting hues of porcelain stoneware tiles from Marazzi's Policromi series infuse an Italian country kitchen with traditional charm and ambiance. 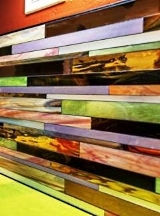 Decorative inserts and borders add visual and architectural interest. 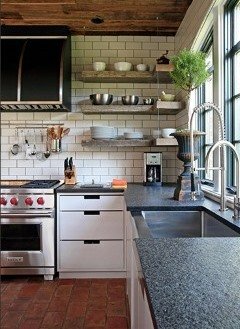 Since its debut in 1904, subway tile has become a mainstay in American kitchens and baths -- a tradition that continues to this day. 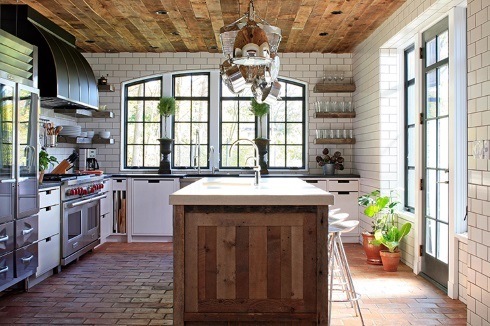 Durable and easy to clean, subway tile is also extremely versatile. 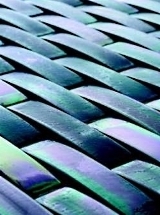 Due to its simplicity and clean lines, it can be used in virtually any setting . 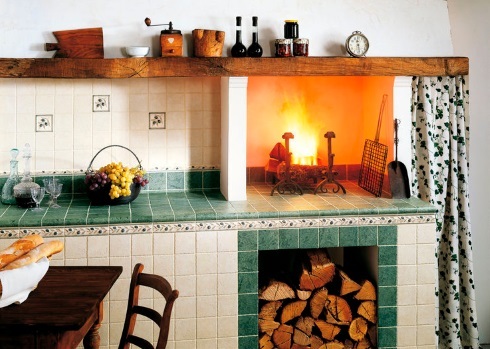 . . . . from rustic to refined . . . traditional to contemporary. 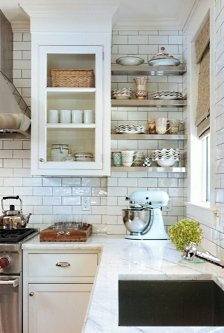 Royal blue subway tiles create a stunning backdrop for white cabinetry and millwork in a kitchen makeover (below) by Howells Architecture + Design. 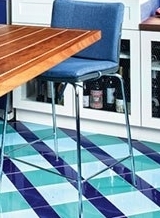 The kitchen tile backsplash is laid in a running bond pattern. A European style cottage kitchen (at right and below) on Chicago's North Shore is awash with natural light via large windows and a tall French door flanked by sidelights. 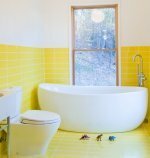 Crisp white subway tiles line the walls from floor to ceiling in this striking transformation by Burns and Beyerl Architects. Below right, Victorian era styling lends nostalgic charm to a design by John Malick & Associates. 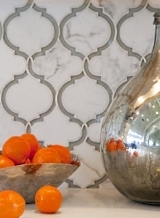 The kitchen tile backsplash features an octagon and dot pattern in contrasting colors. 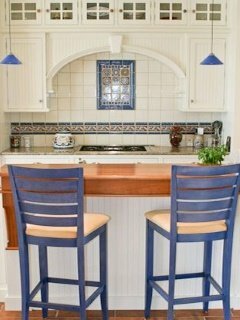 Coastal cottage kitchen designs by Michael McKinley and Associates evoke soothing shades of beachfront life. 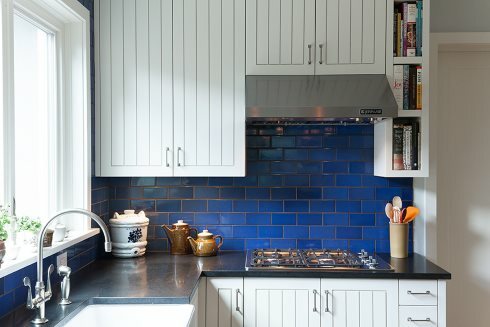 Below, left, an outdated waterfront kitchen is transformed by a sea of deep blue subway tiles and contemporary white cabinetry (Photo Credit: Warren Jagger). 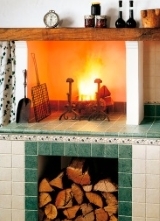 The compact cottage design pictured below, right, features a tile backsplash of white ceramic squares pierced by a colorful listello, or band of narrow tiles, and a panel above the cooktop framed with dimensional border tiles. 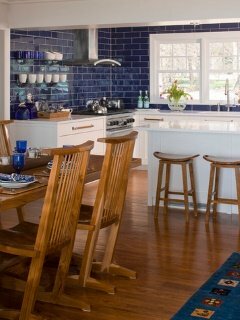 Designed by Elizabeth Swartz Interiors, a beachfront cottage kitchen on Martha's Vineyard sports cool blue cabinetry and frosted blue tiles. 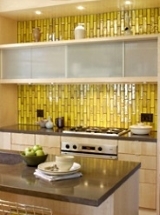 The glass tile backsplash is from AKDO. 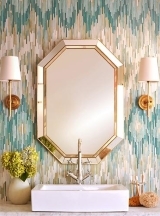 Please check back often or subscribe to our RSS feed, as we frequently add new kitchen tile backsplash designs to our site.